At Wilson Laidler & Co. Ltd, we take great pride in delivering a highly professional surfacing service. Our on-site team always ensures that it consults you every step of the way and we have the capacity to perform a range of jobs, both big and small. Did you know that we clean and resand damaged surfaces? Not only that, but we undertake repair and removal work on block paved areas, as well as providing specialised coatings where necessary. If you’d like to learn about what we can do for you and your project in Sheffield, contact our team by calling 0114 248 1158 or 07834 804 240, or by filling out our simple contact form. Block paving is a great way to enhance the look of your property. Not only does it have a quality, modern looking finish but it’s also low maintenance. Our team specialises in laying block paving, meaning that we can transform your home in Sheffield in the best way possible. When it comes to laying something as fundamental as concrete or tarmacadam, you need a construction specialist that can work within your budget, time constraints and site regulations. That’s where Wilson Laidler & Co. Ltd and our surfacing services come in. Our qualified team always works within your parameters and consult you every step of the way to ensure peace of mind. 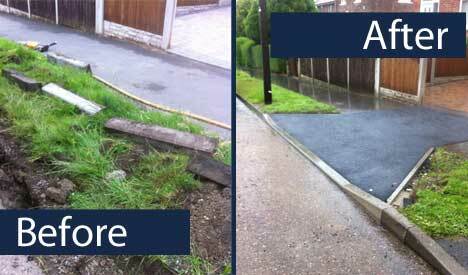 Here at Wilson Laidler & Co. Ltd, we are specialists in providing driveways for customers throughout Sheffield. We are dedicated to providing the best finish and a final product made using excellent materials, so contact us to learn more about what we can do for you. When you need line marking for a new construction development, you want someone you can depend on to do the job for you in a quick and easy manner. At Wilson Laidler & Co. Ltd, we have years of experience in providing quality line marking services to a variety of businesses and organisations in the Sheffield area. We only use thermoplastic in all of our line marking, providing your premises with a durable and long-lasting marking solution. From retail parks to hospitals and residential areas, there’s no job too big or small for our friendly, professional team.